The Famous Dodge City Peace Commission. 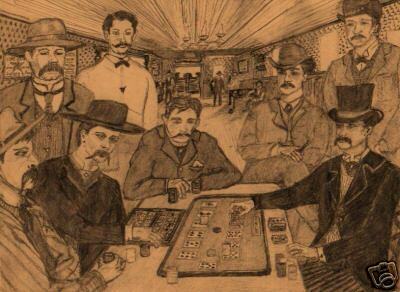 Front Row: Charlie E. Bassett, Wyatt Earp, M. F. McLain, Neal Brown. Back Row: William H. Harris, Luke Short, Bat Masterson, W. F. Petillon. 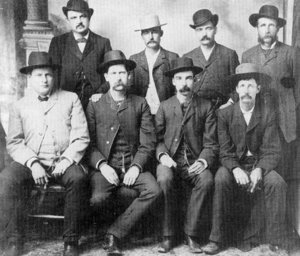 I found that Jay Robert Nash, in his book, Encyclopedia of Western Lawman & Outlaws shows the Peace Commission photo on page 434 and indicates that the man seated front row, third from left is M. C. Clark. A check of the 1880 Federal census reveals an M. C. Clark, age 23, living Blue Rapids, Marshall, Kansas with parents and sibling. So is it Frank McLain or M. C. Clark ? At the time, many lawmen were also active gamblers, like Wyatt Earp, who used to play poker and even worked as a Faro and Poker Dealer. This wasn't uncommon back in the old west, and is interesting to note that gambling was one of the common practices shared both by lawmen and by outlaws. If only they could have seen the future with Online Casino gambling and Online Slots. Speaking of Slots, the forerunner to the Slot Machine existed back then in the form of a Trade Stimulator. These machines are highly collectiable today. Well, I have found a second source that reports that the man seated between Wyatt Earp and Neal Brown, in the famous Dodge City Peace Commission photo, is M. C. Clark. James D. Horan and Paul Sann, in their book, " Pictorial History of the Wild West", pg. 105 presents the photo and caption. On page 247, Picture Credits, they indicate the photo came from the Kansas State Historical Society. That is not to say that the Historical Society provided the names, just the photo. Other members of the Peace Commission who chose not to be photographed include: Milsap (Johnny Millsap), Shotgun (John) Collins, Shoot-your-eye-out Jack (Jack Vermillion ), Crooked-mouth(Johnny) Green, Rowdy Joe Lowe, W. J. Mason and some say Doc Holliday. It has also been written that Petillion was not a member of the Peace Commission but just wanted to be photographed with this group of men. The Dodge City Times reported that there was an influx of noted men in town including: Black Jack Bill, Cold Chuck Johnny, Dynamite Sam, Dark Alley Jim, Dirty Sock Jim, Six-Toed Pete and Three Finger Dave. Lawman Bill Tilghman also appears in one of the photos. Lastly, it should also be noted that Constable, Prairie Dog Dave ( Dave Morrow ), had sworn in all members of the Commission making it possible for them to carry guns. Dan Tipton, Johnny Green, Texas Jack Vermillion and Johnny Millsap. Masterson precedes by twenty-four hours a few other pleasant gentlemen who are on their way to the tea party at Dodge. One of them is Wyatt Earp, the famous marshal of Dodge, another is Joe Lowe, otherwise known as "Rowdy Joe;" and still another is "Shotgun" Collins; but worse than all is another ex-citizen and officer of Dodge, the famous Doc Halliday. The Dodge City Peace Commission was formed as a direct result of the actions taken by the Powers-To-Be, namely former Mayor Alonzo Webster and his 300 pound whipping boy newly elected Mayor Larry Deger. Webster, owner of the Old House Saloon, wasn't able to attract the business Luke Short was because of Luke's Texas roots. Webster devised a plan whereby Deger would have Luke's girls arrested but Webster's girls were left alone. Luke took exception to this and went looking for those responsible. Louis Hartman, City Court Clerk and special Policeman saw Luke coming in his direction and knew it meant trouble. Hartman decided to get off the first shot so he took aim and let go a round missing Luke. Now think about this for a minute. Luke was not a criminal. He was not wanted for anything. Yet here is a policeman shooting at him because he knew Luke had been wronged. Just imagine such a scene taking place in a casino in Vegas or on the streets of modern day Dodge City. Well Luke wasn't going to put up with that type of treatment. Luke returned fire as Hartman was in full retreat. As Luke fired Hartman stumbled and fell. Luke, believing he had just killed Hartman headed for the Long Branch. The next day Luke learned he had not killed Hartman and submitted to arrest. Webster and his cronnies decided to run Luke out of town instead of allowing the legal process to run its course. So much for the Law and Order platform Deger ran on when elected. Luke was put on an eastbound train which stopped at Larned, Kansas. Luke got off and telegraphed Bat Masterson. This was the beginning of the Dodge City Wars. A war in which a shot was never fired. Stop by OldWestAntiques.Biz to browse our collection of Old West Gambling Items. owned by Dodge City Peace Commission.